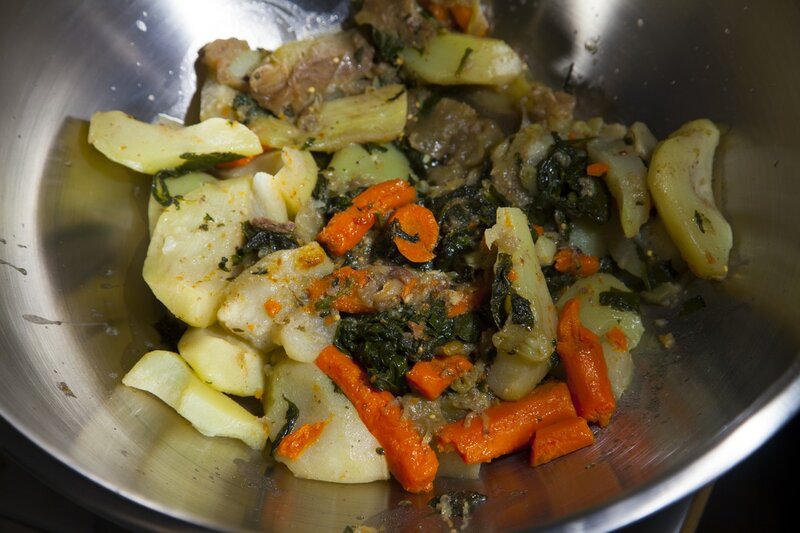 ​Legume is probably one of the most labor intensive Haitian meals out there. 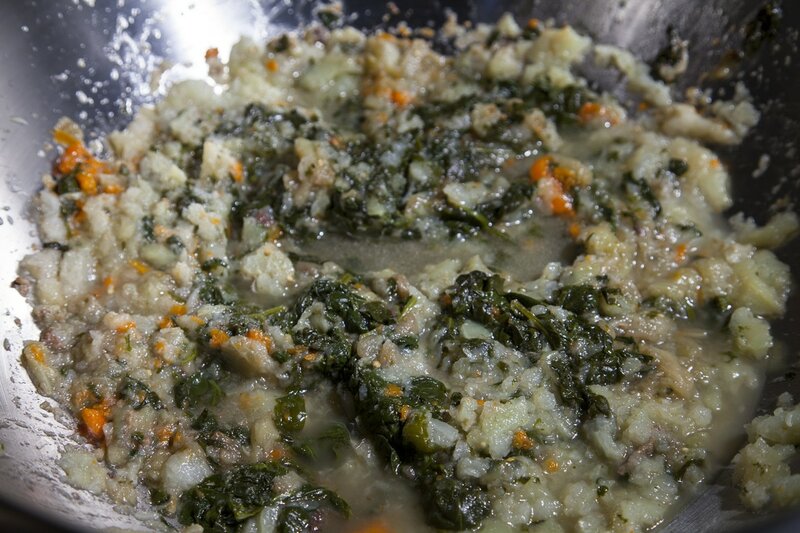 It consists of some form of protein like beef that gets mixed together with a variety of vegetables that are mashed. 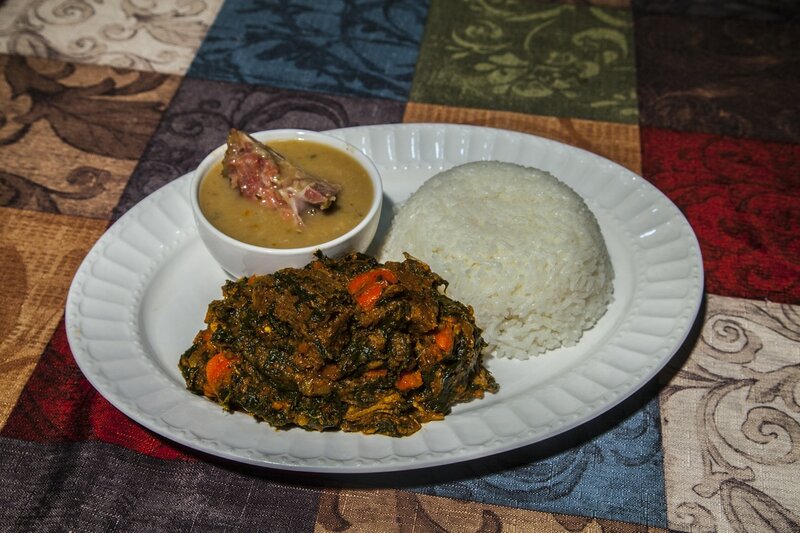 As with any type of Haitian dish, legume has several different variations. It can be made with beef, chicken, turkey, shrimp, crabs, conch, pork, or a combination of any of the above. My favorite is with beef and snow crab legs. 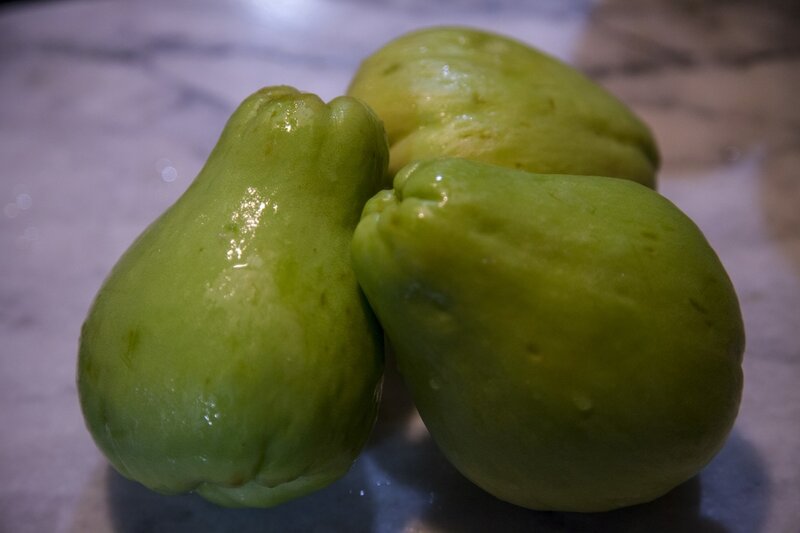 Although the vegetables can be variable, it HAS to include these key ingredients: “militon” (chayote), “berejenn” (eggplants), spinach and carrots. Other vegetables that can be used but not mandatory is cabbage, collard greens, green papaya, green beans, and mixed vegetables, just to name a few. ​Legume is a true traditional Haitian dish that is native to the country, just like diriz djon djon (black mushroom rice) is. I say it’s labor intensive because of the preparation involved and the time it takes to cook. 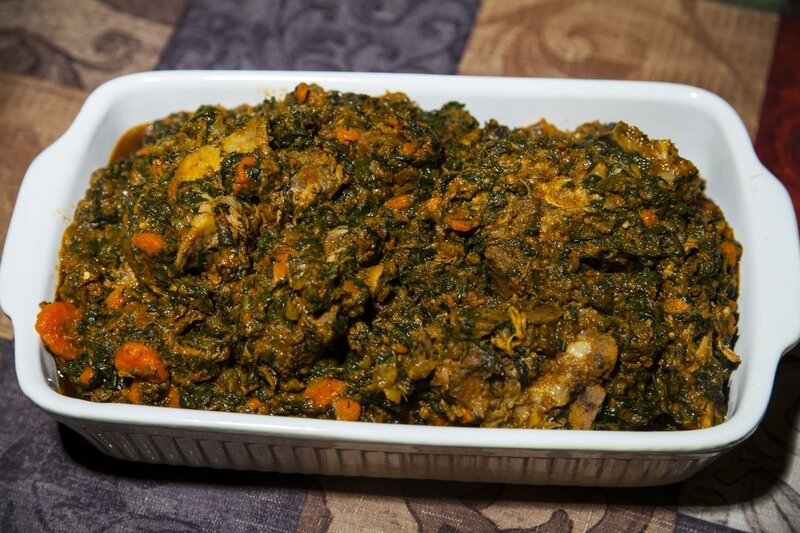 However, if done right with the perfect combination of ingredients, legume is very well worth it. Once all the ingredients are prepped and ready to go, then the process isn’t actually that bad. It’s usually accompanied with diriz blan (white rice) and any type of sauce pwa (bean sauce). This meal is very filling and packed full of protein and vitamins. I had the opportunity to visit my uncle in New Jersey and he made legume which was undoubtedly delicious. The steps and pictures I provide for you are all from his home and kitchen. Now be warned, he also has a large family and so the ingredients and proportions are HUGE. You should have seen the pot he used to make this thing! He could probably feed a village. But I kid you not, this thing lasted only 2 days. Yes, it was that good. I plan to post a smaller proportion of legume sometime in the near future, especially if this is going to be your very first time trying it out. However, those of you who already know how good legume is and are just looking for a recipe to feed a large family, then by all means, please try this one out! 1. 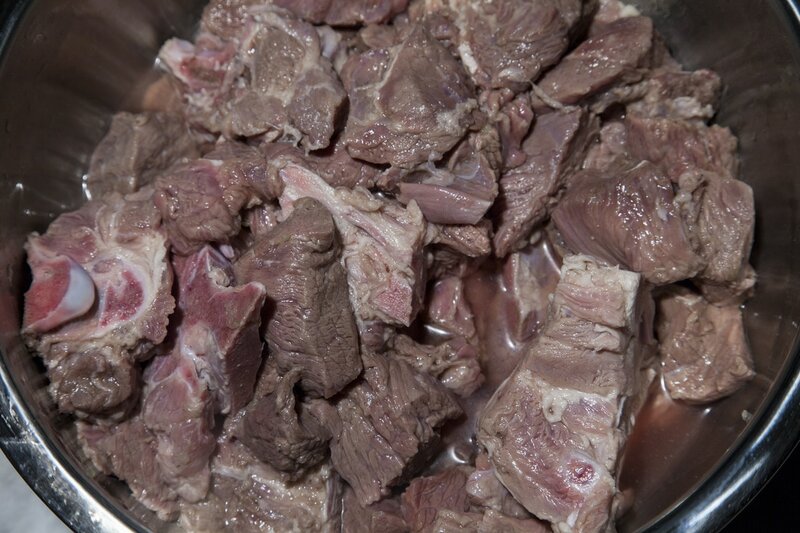 With most Haitian cuisine, cleaning the meat that will be used in a recipe is imperative. 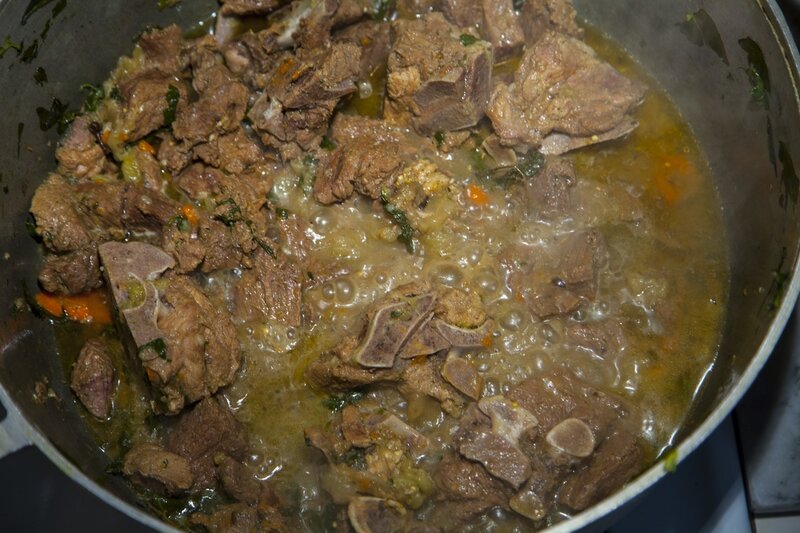 After removing most of the fat and junk from the pork neck bones, you can combine it with the beef stew in a large bowl and refer to the “Cleaning Meat” page. ​2. 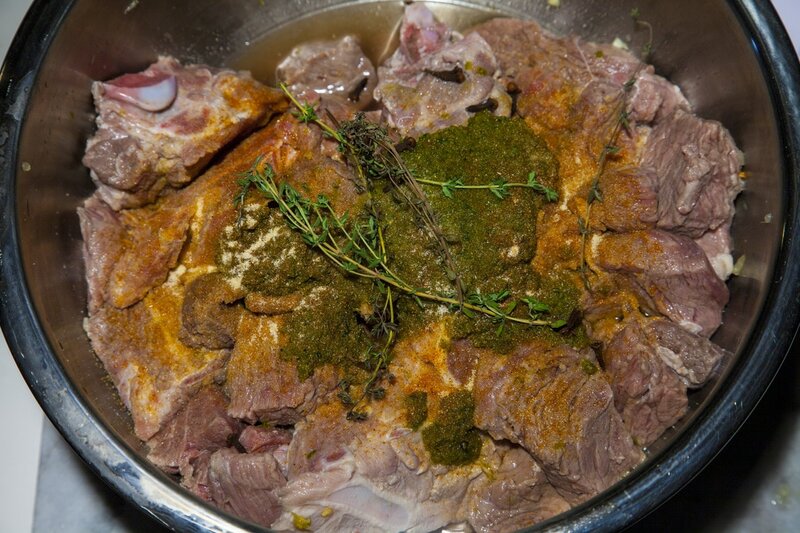 Once meat has been cleaned, add the following ingredients: ½ cup Epis, 4 sprigs of Thyme, 1 tsp. Seasoned Salt, 1 tsp. Garlic Powder, 1 tsp. Accent, 1 Maggie Chicken Boullion Cube, 10 Cloves, 2 tbsps. Lemon Juice, and 5 cloves of crushed Garlic. Mix all the ingredients well to incorporate in the meat then set it aside to marinate for at least ½ an hour while you prepare the vegetables. ​3. 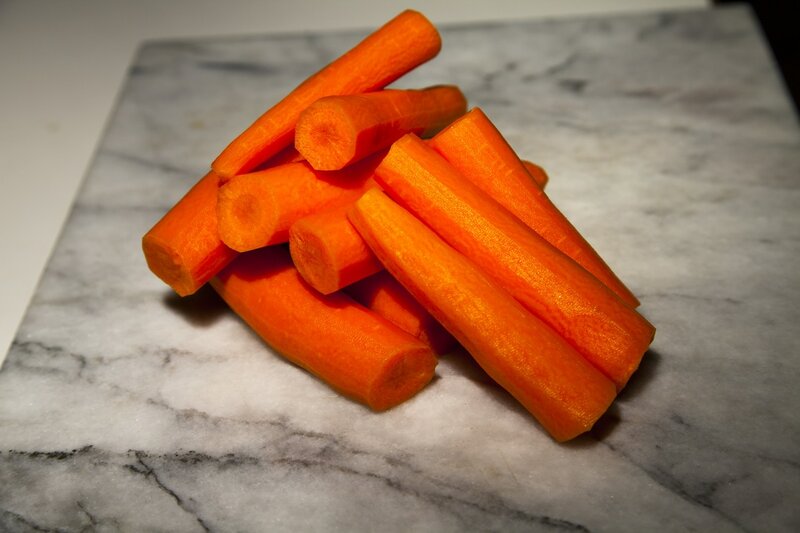 Peel, wash, and cut in half at least 6 carrots. 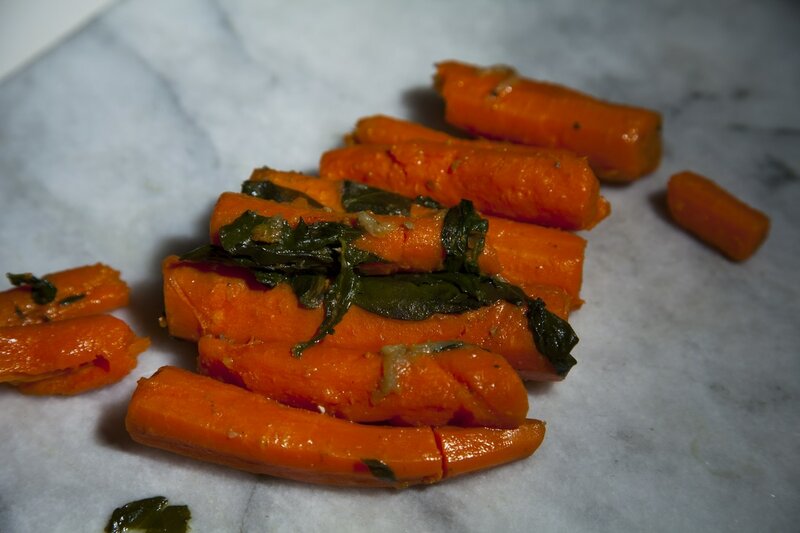 Set the carrots aside. 4. 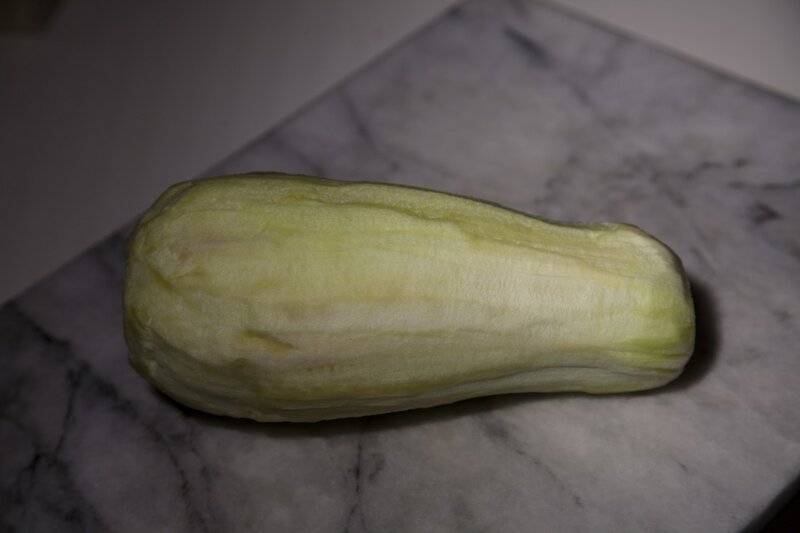 Peel the skin off of 2 large eggplants and quarter them lengthwise. Under cool running water, carefully scoop out with your thumbs as much of the seeds as possible. 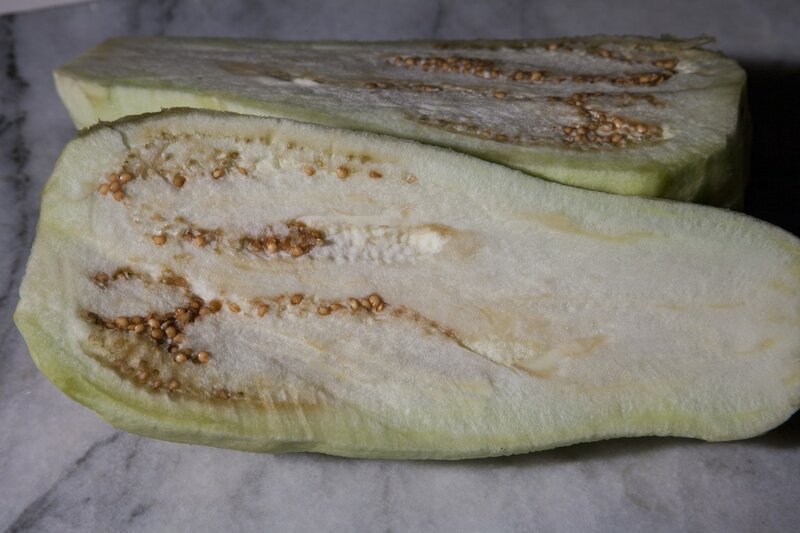 It is much easier to remove the seeds under running water than trying to scrape them out. It would be best to gently slam it on a hard surface as you rotate to get to all sides. This will help loosen up the seeds. 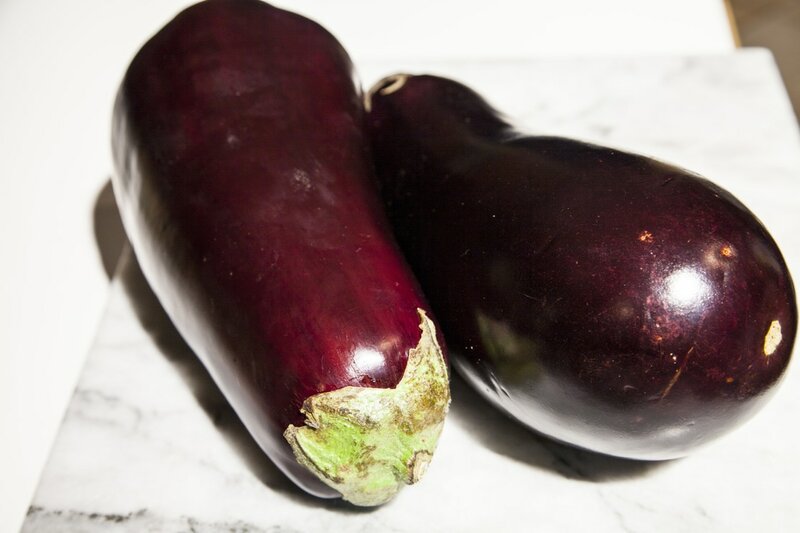 Set the eggplants aside. 5. Place 6 - 8 chayotes in a bowl with cool water. 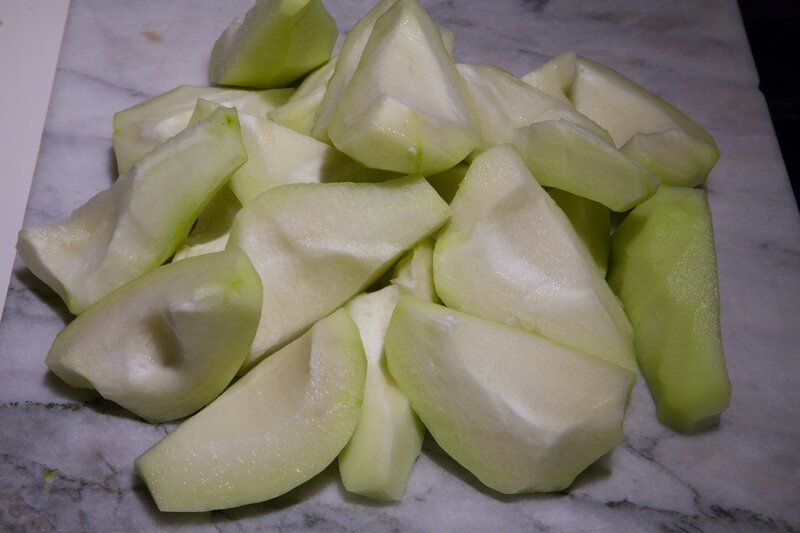 It is very important that you peel these under water in the bowl. Or at least under running water. These leave behind a weird sticky film on your hands that is difficult to remove if you peel them with your hands dry. Trust me, I’ve learned this the hard way. 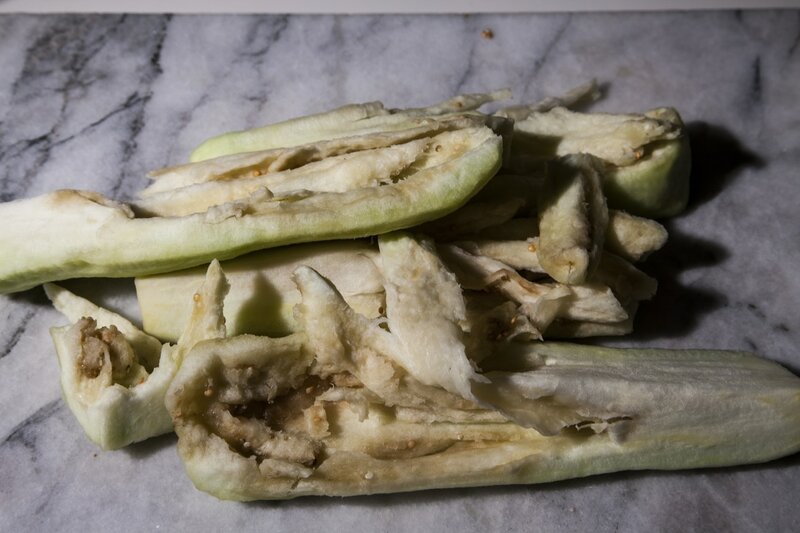 After peeling the skin, cut them in half lengthwise revealing its core. Scoop out the core and discard. 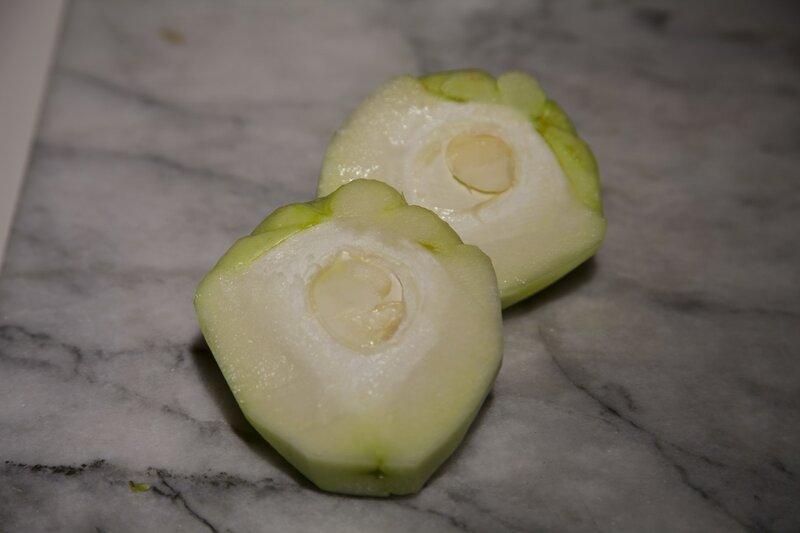 If the chayote happens to have brownish specs all throughout the inside, throw it away as it is no longer good. When it cooks down, those brownish specs remain hard and never soften. It’ll be like biting into little pebbles. So be on the lookout for those. 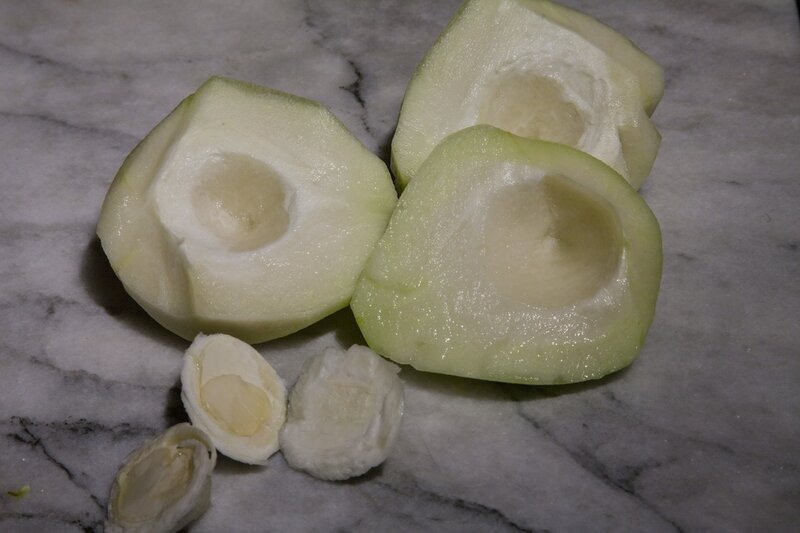 I’ve also learned that the hard way… After removing the core, cut the halves into half once more. 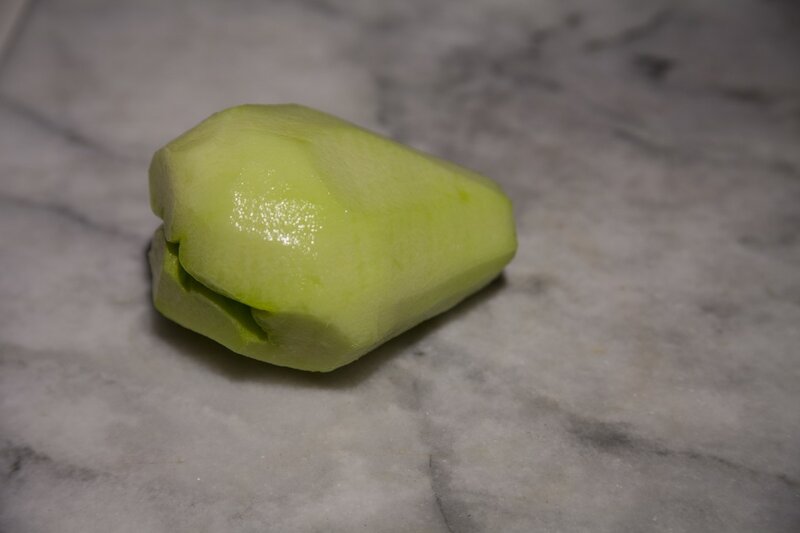 Basically, each whole chayote will be quartered. Set the chayotes aside. 6. In an extra large pot, pour in ½ cup of vegetable oil and put on high heat. Add in the marinated meat. On top of the meat, place in carrots, eggplants, and chayote. 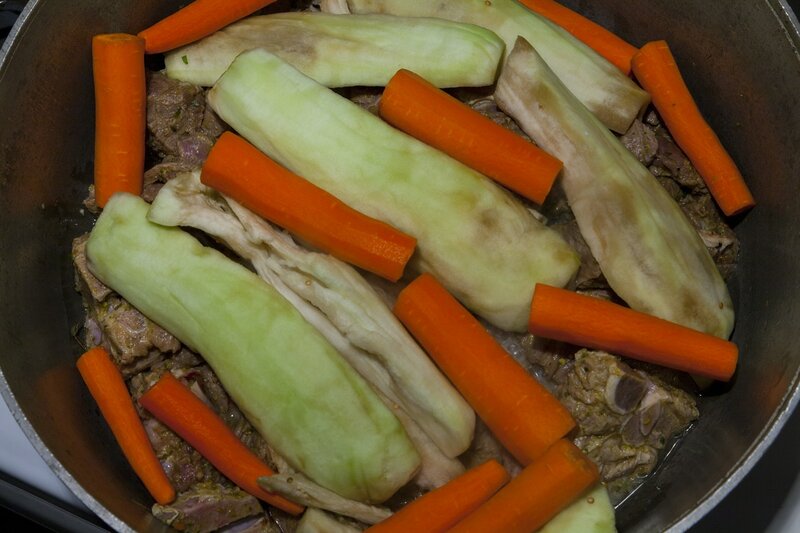 As the meat cooks and produces its own juices, the vegetables absorb some of the flavor. 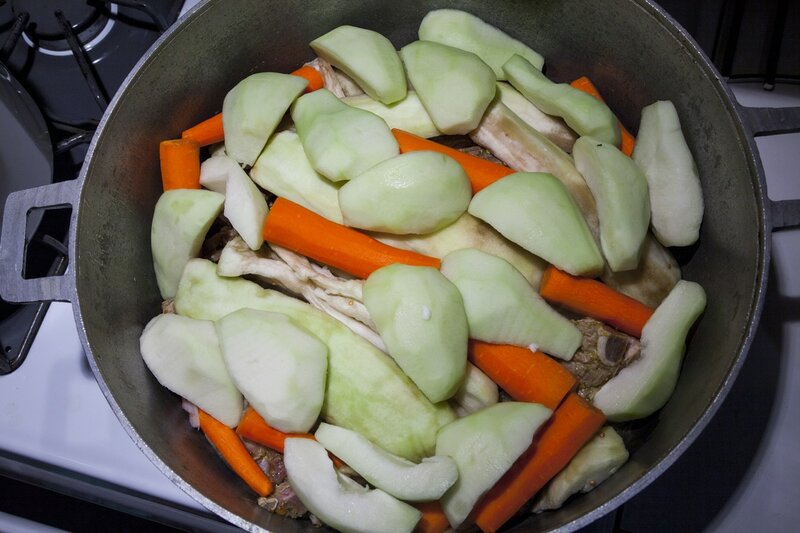 To that end, the vegetables will cook down from the steam produced but won’t break apart since they are cut so big. It makes them easier to remove in the upcoming steps. ​7. 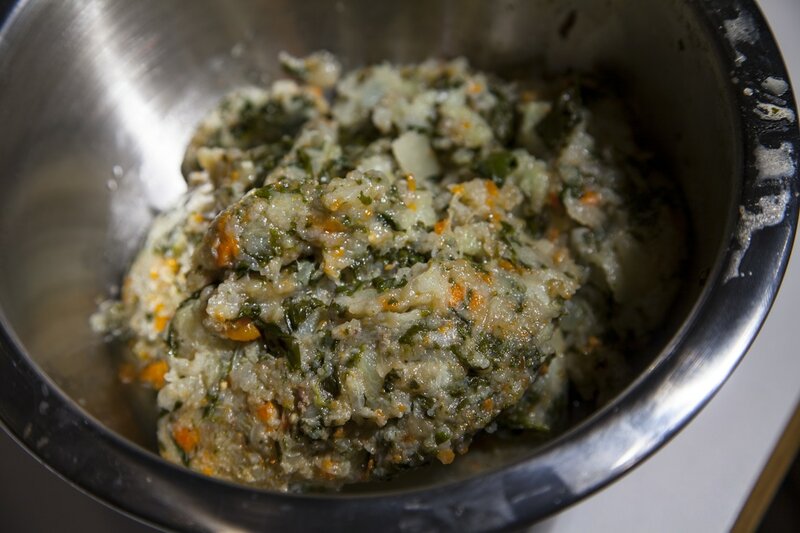 To the top of the vegetables, add in as much spinach as you can fit. 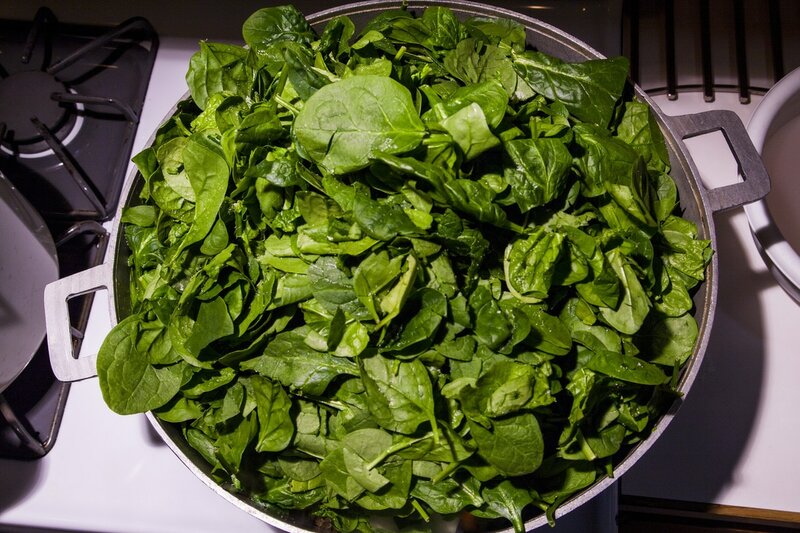 It may look like a lot of spinach but when it wilts and cooks down, you’ll wonder what the heck happened to it… For the amount of spinach, you may have to do it in 2 batches. After the first batch, about 2 pounds, cover the lid to the pot and let it cook on high for about 10 minutes. After 10 minutes, lift the lid to add in the remaining 2 pounds (DO NOT STIR THE CONTENTS) and return the lid to the pot. 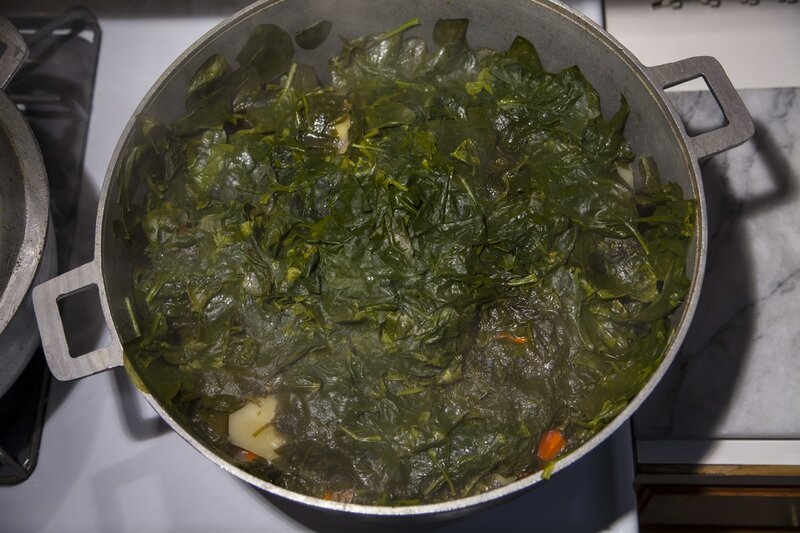 If you don’t have a big enough pot, you can always boil the spinach separately. 8. Continue to cook the contents covered on high for about another 50 minutes. Do not lift the lid or stir the contents in the interim. The meat should have produced enough of its own juices to keep everything from drying up. Once the time has elapsed, the meat should be cooked and tender but should not be too soft to the point of breaking apart. ​Reduce the heat to low and remove the contents from the pot separately. Place the spinach in one container, the chayotes and eggplants together in another container, and the carrots to a cutting board. It may be difficult to completely separate the items but that is completely ok.
9. 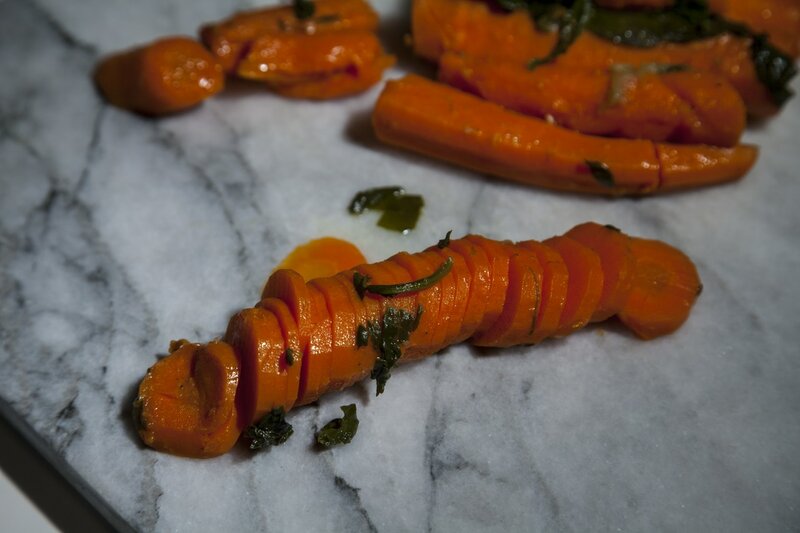 Slice the cooked carrots and set it aside. 10. With a potato masher (or the underside of a cup), mash the chayotes and eggplants together until it forms a “mush”. This process will also produce a lot of liquid. 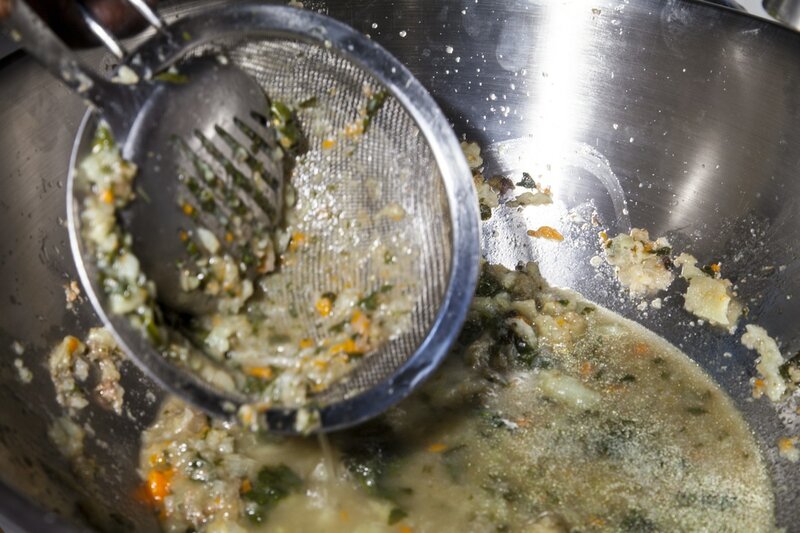 Strain the squashed vegetables with a fine mesh strainer. 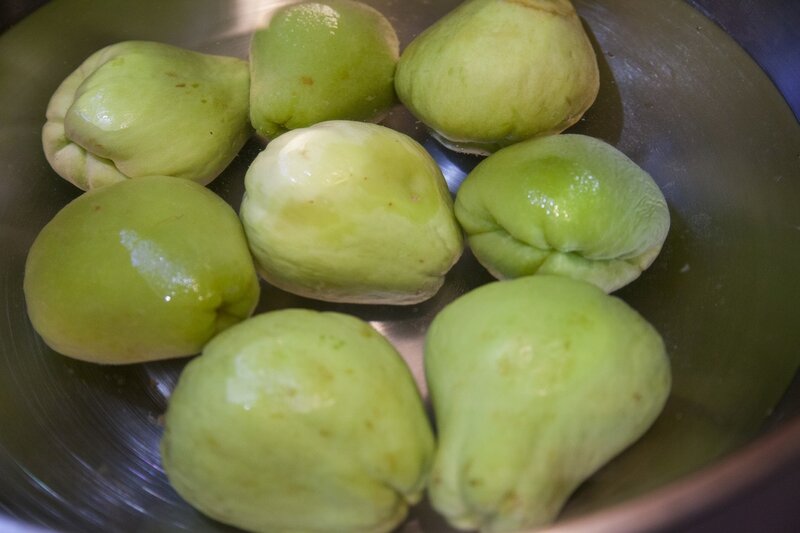 Set the chayote and eggplant mush aside and reserve the liquid. ​11. 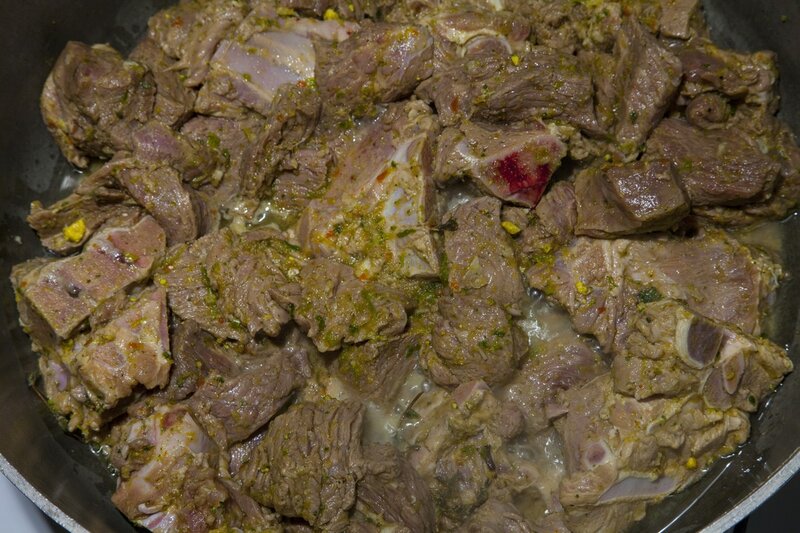 Returning to the pot, remove as much of the liquid in the pot as possible so that only the meat remains. Return the heat to high, add in ½ cup of tomato paste, mix the contents together and sauté the meat so that it will darken and develop color. Add in a little bit of the liquid that was removed whenever needed only to keep the meat from completely burning. Sauté the contents for about 5 - 10 minutes. 12. 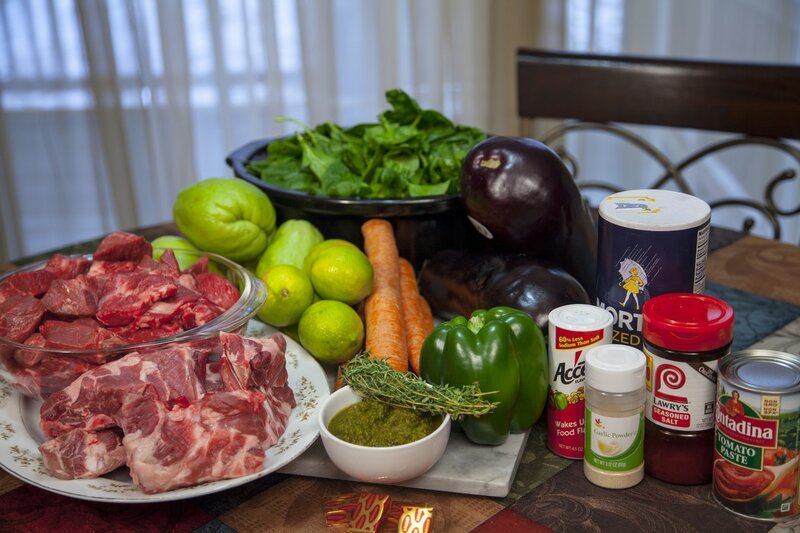 To the pot of meat, add in the spinach, the squashed vegetables (chayote and eggplant), and mix the contents thoroughly. 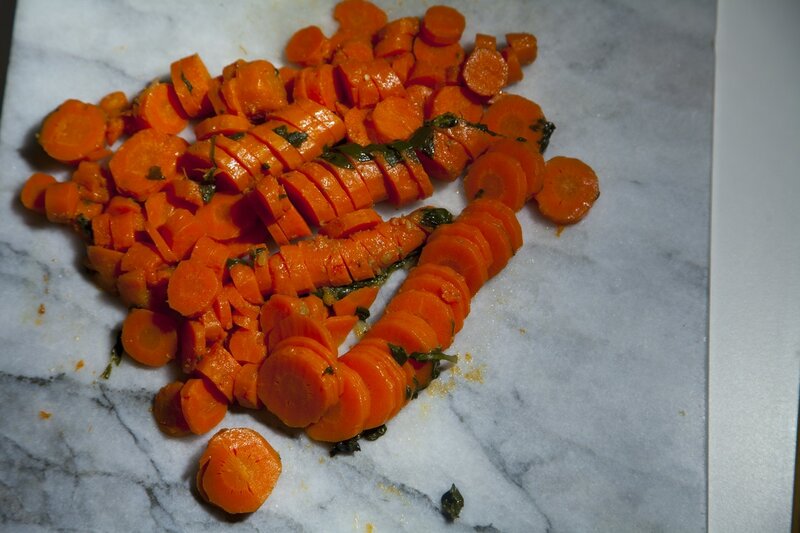 Once well incorporated, add in carrots last so that they won’t fully break apart. 13. Leave it on high stirring every couple of minutes until the squash becomes a dark color. Add in 1/4 cup of butter and mix thoroughly until melted and well combined. Add salt to taste if desired. If you feel it is too dry, you may add a little of the reserved liquid. It should not be too wet/saucy nor too dry. Turn off heat once complete. This is best served with white rice and sos pwa. What do you think of this recipe? 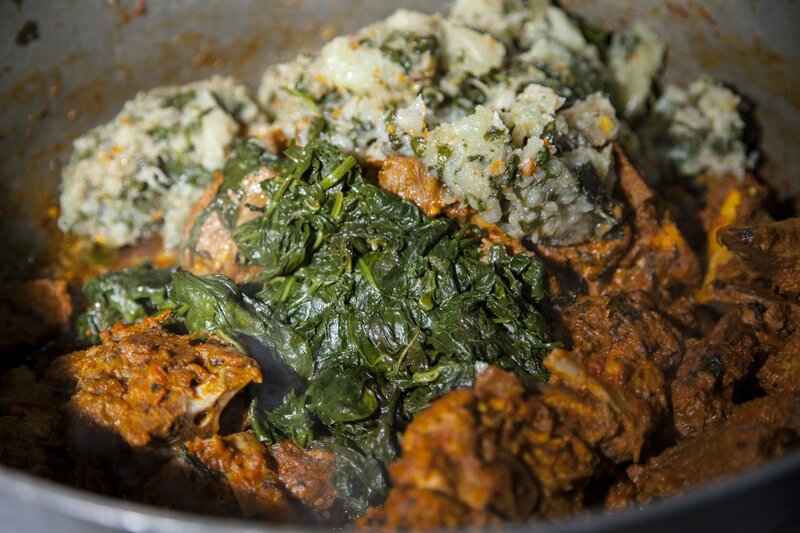 What's your favorite combination of legume?